Synopsis: Arkon appears on the streets of New York in a flash of lightning, cursing the fact that he must once again seek help from Earth's heroes to save his world. He visits the Avengers Mansion to find Thor, but learns from Jarvis to his great frustration that the Thunder God is away on personal business. Arkon is contacted by his Grand Vizier who informs his liege that there is another being on Earth whose powers may be of assistance. At Prof. Xavier's School for Gifted Youngsters, Colossus, Cyclops, Nightcrawler, Storm and Wolverine are training in a Danger Room session that is being overseen by Banshee. The Danger Room goes out of control in a freak accident caused by Storm in a moment of panic and the team is put though the paces in a frantic effort to get it under control while fighting for their lives. Storm is ashamed of her conduct and expresses regret to Cyclops that turns into a deeper conversation about the personal price they pay for the lives they lead as heroes. Upon her return to her attic loft, Storm is ambushed by Arkon and blasts him through the floor with a hurricane-force wind. 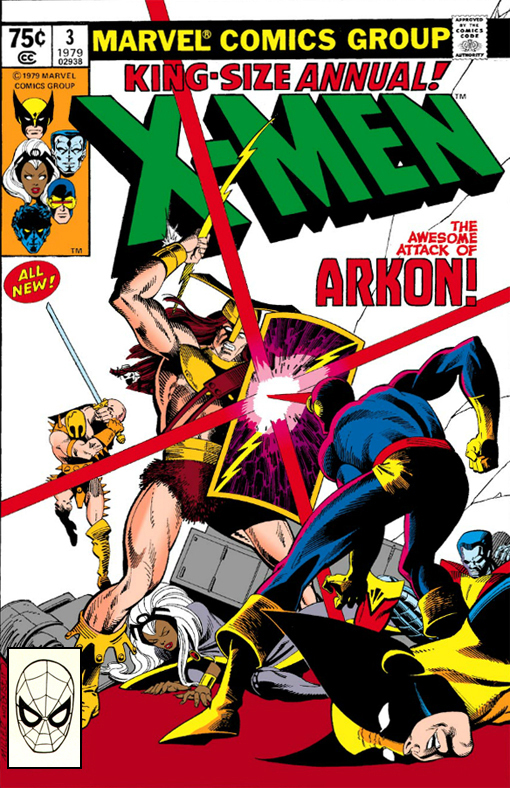 A fantastic battle ensues as the X-Men go blow-for-blow with Arkon, leaving a path of destruction in their wake. Facing difficult odds, Arkon transports Storm to his dimension with a lightning bolt in an act of desperation and continues to fight the mutant heroes before finally being overpowered. While Arkon refuses to cooperate or explain where he sent Storm, Cyclops deduces that their foe's golden lighting bolts can be used for inter-dimensional transport. The X-Men appear with their prisoner in Arkon's imperial throne room and try to exchange Arkon for Storm. Arkon orders his troops to attack and a fantastic melee follows as the X-Men fight for their lives. While the X-Men battle Arkon's troops, Nightcrawler follows the Grand Vizier through a series of tunnels to a mountaintop fortress where he finds Storm. He plans to rescue her but overhears a conversation that leads him to believe that Storm has been brainwashed into participating in some plan that will result in her death. Nightcrawler summons his teammates who escape the fight on the back of a dragon and join Storm at the mountaintop fortress. Storm tells the team that she cannot leave because she is committed to helping Arkon and his people. Arkon explains that the energy ring surrounding his planet that serves as a light source is once again fading because the device made by Iron Man in Avengers #76 (May 1970) had failed and needed to be recharged by the power of a god. Arkon believed that Storm's power would be sufficient to recharge the device, but likely at the cost of her life. Cyclops devises an alternate plan and has Colossus act as a conductor for Storm as she summons and holds her lighting blasts which are then unleashed on Cyclops whose mutant body is meant to absorb solar energy but somehow manages to metabolize and store Storm's incredible onslaught. When he can withstand no more, Cyclops unleashes his optic beam into the device, igniting it and restoring the energy ring to Akron's planet. The X-Men survive the energy fallout blast and are declared friends and heroes by Arkon. A great celebration follows before Akron sends the mutant heroes home with his lighting bolts.